Khoon Bhari Maang is a 1988 Indian Hindi revenge thriller movie released on 12 August 1988, directed and produced by Rakesh Roshan. 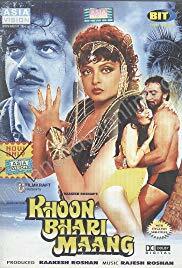 It is a remake of the Australian mini-series Return to Eden (1983), and stars Rekha as a wealthy widow who is almost killed by her husband and sets out for revenge. The film was a comeback venture for Rekha, and was a critical and commercial success. The film was remade in Telugu as Gowthami, starring Suhasini, in Tamil as Thendral Sudum starring Radhika and in Marathi Bharla Malwat Rakhtaana starring Kavita Radheshyam.